It looks like a jellyfish but it isn't…Porpita, shown here, isn't even a single organism, but a colony! The central disc is reinforced with a chitin-like material and is chambered in cross-section; filled with gas, it keeps Porpita afloat, for these are pelagic creatures. The "tentacles" of Porpita are in fact individual zooids, each of which is specialized for a particular function, such as digestion, prey capture, or reproduction. 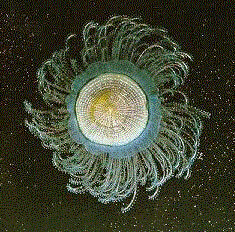 Porpita is a member of a small but very widespread group of hydrozoan cnidarians, the Chondrophorina. There are only two accepted genera of chondrophorines, Porpita, shown above; and Velella, which resembles Porpita but has a keel-like "sail" on its aboral surface. Both often wash up on beaches in huge flotillas of thousands of organisms. Chondrophorines were once classified with another unusual group of hydrozoans, the siphonophores. The most famous siphonophore is Physalia, the so-called "Portuguese man-o' war." Like Porpita, siphonophores somewhat resemble jellyfish but are actually colonial organisms, with different individuals specialized for different functions; most, but not all, have a gas- filled float.